Hard lambrequin: how to sew by own hands a lamp with an application or for a kitchen? 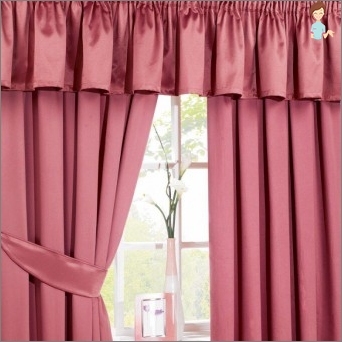 Lambrequin is a special piece made of fabric,Which is strengthened above the apertures of doors or windows and thereby completely or partially closes the curtain rail. 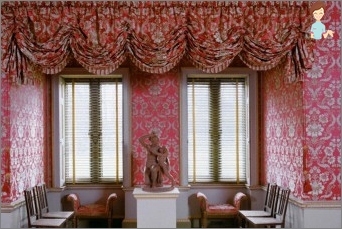 Hard lambrequin or bando gradually displaces its soft fellow and takes its place of honor in the interior of the room, introducing a note of elegance and grace. It would be a mistake to think that hard lambrequins orThe bando appeared relatively recently. Our ancestors adorned them with small windows a few centuries ago, with the aim of visually making them wider. Today they are again popular, especially among owners of apartments with low ceilings. Such a stiff construction visually increasesSpace in the room, expands its boundaries in height and, of course, performs the role of interior decor. Modern materials and fabrics make it possible to create an incredible beauty in a variety of styles. You can draw inspiration from a touching sentimentality or timeless classics, and to decorate a children's room you can use cartoon drawings. 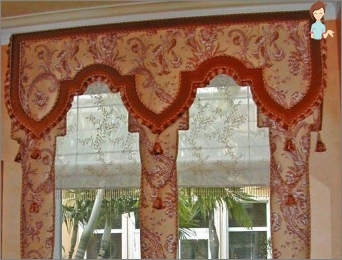 Lambrequin on the bando has an adhesive base that takes on the role of its frame. Bando often carries a different name - Shabrak. His design was given by the manufacturer. In the olden times, hard lambrequins sewed their ownHands of non-woven, sintepon, foam rubber or doublerin. Today, in the age of new technologies and modern materials, the process of its manufacture has been greatly simplified thanks to the use of a special self-adhesive thermoband. It can have a different density, andThe hot melt blend is applied to both the one and the both sides of the material. Self-adhesive canvas on one side is treated with glue, and on the other is equipped with a protective film. Often one side is covered with foam rubber orPile, which provide better grip with the Velcro strip. 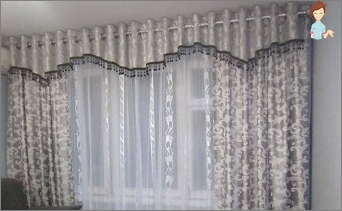 To independently produce an exclusive and elegant decorative detail for curtains, you will need a pattern and a specially designed material. Picking up the color and drawing in accordance with the subject of the room, you can make the situation in the room more complete and stylish. What else do you need to know before manufacturing? Varying the texture of the fabric can achieve a multi-tier effect. Experts advise always to take into account the stylistics of the room and its color when choosing a bando. Numerous waves and bends can "Eat" Drawing with a small print, and this must be remembered. Place your bet on a large print or material with a vertical pattern. At first, this seemed simply unrealistic, becauseAs a simple philistine did not yet know all the intricacies of manufacture and did not have the opportunity to purchase special improvised means. Today, this product, worthy of the hands of a talented artist or decorator, can be allowed to do yourself. Everything, the bando is ready! You can make a hard lambrequin with a beautiful application, gluing on the base of flowers, different patterns and original curls - this is how your fantasy tells you. 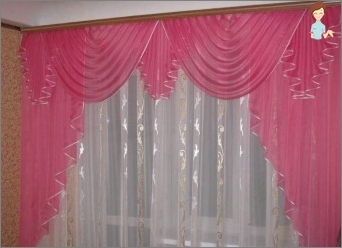 To hang lambrequins on the windows and decorate the interior design in this way, it is necessary to attach a strip of Velcro to its underside with a soft side. It will help to attach the bando to the cornice. With your own hands, you can sew a gang of bothFabrics, and from one, to work with a glutinous basis and without it. In the latter case, only a pattern, a skeleton and applications are needed. Even the most common design can be decorated with decorative elements and get a product worthy of the best houses in London and Paris. Decorate their kitchens, bedrooms and other rooms, look for inspiration in magazines and the Internet and do not be afraid to try - sure you will succeed!